Hot sauce has never been hotter, both in terms of popularity and now spice too! That’s because a team of British scientists have created the world’s first chilli sauce which mimics the bite of a venomous spider. And yes, I too am asking why on Earth did they think this would be a good idea. It sounds awful! 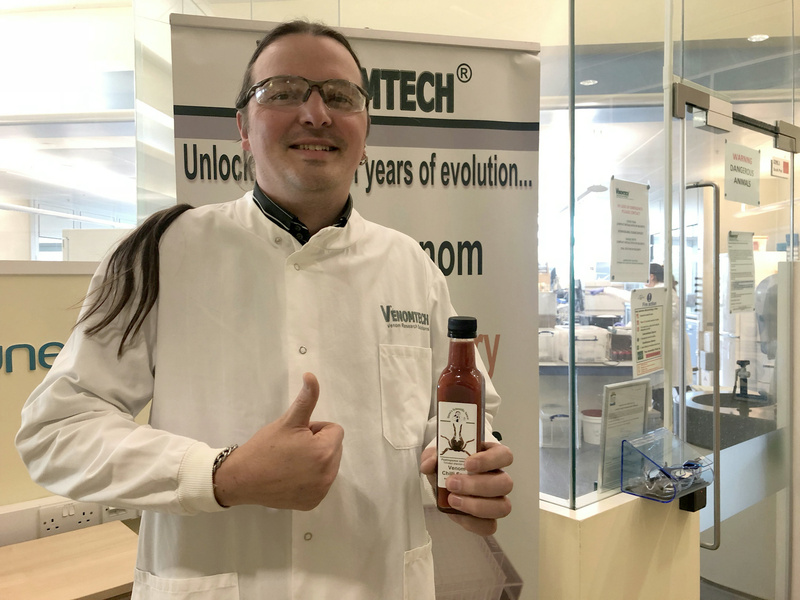 Kent-based drug discovery business Venomtech produced the sauce, known as Steve’s Scientific Sauce, as a side project. Specialising in venom-based research, the company created the product in the hope it would inspire budding biologists. Thought to be a world-first, the sauce was designed using test data from hundreds of arachnids, and has a tingling sensation which mimics the effect of being bitten by the Trinidad chevron spider. Again, why would you make this? 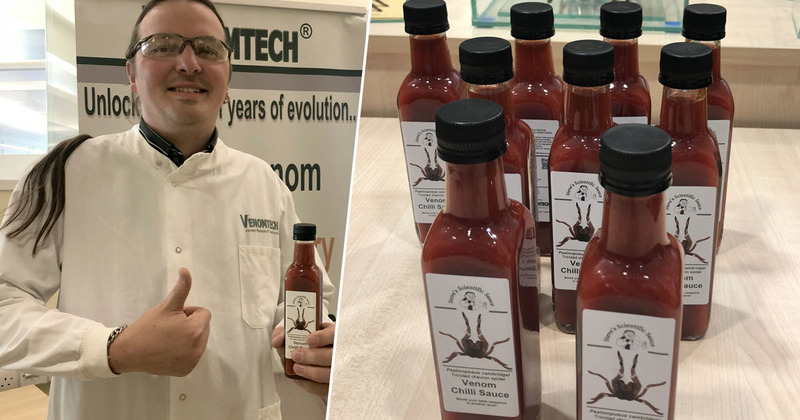 Managing director and founder of Venomtech, Steven Trim, said the idea came to him after he met food marketer Stefano Cuomo, of Macknade Fine Foods, at a meeting two years ago. I did think it was crazy. I laughed it off at the time and said it was hilarious to do. Nobody has been foolish enough to try the venom. But we kept bringing it up when we bumped into each other over the year. We finally hit on the idea of doing a synthetic inspired sauce. It’s as best as we can manage without actually tasting the venom. It’s a similar heat component that the venom would cause. The pair created the best synthetic version of the venom they could, after studying the venom’s peptide component. Although Trim wanted the sauce to mimic the spider’s bite, he admits he never even considered testing the venom as his team worked on it… which I imagine was wise! Steve’s Scientific Sauce uses normal chillies and flavours, and according to the man himself, it goes well with curries and quesadillas. Launching last Halloween, up to 300 bottles have been sold so far, and Trim hopes it will help raise awareness surrounding the use of venom. We know there are people that are arachnophic – they cannot focus on anything but the image of the spider and it’s clearly not for them. 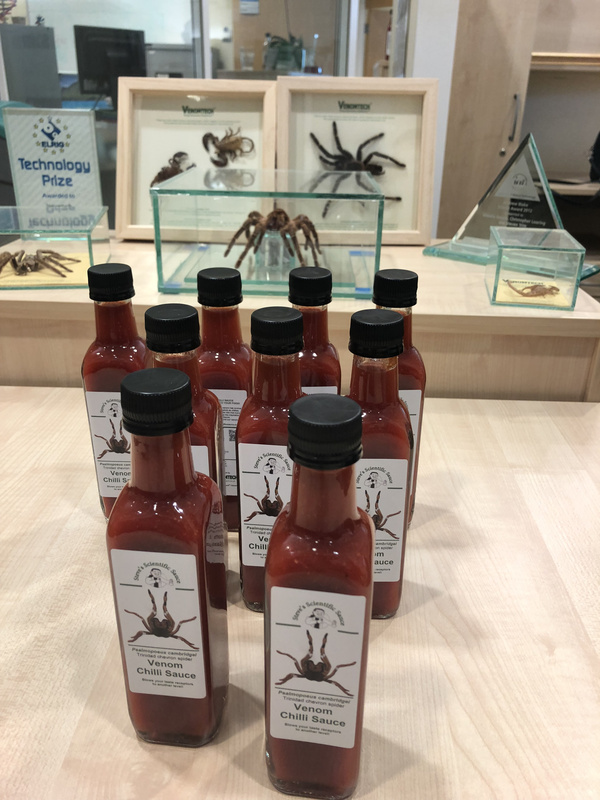 Our aim for this is to raise awareness of the versatility of spiders and hopefully people will understand a bit more about the amazing biology of spider venom through the medium of chilli. It’s hot so for people who are big chilli fans they often say it could be hotter and for people who aren’t they say it’s hot, so it’s nicely in the middle. People who really like their chillies often say it’s really warm. Trim says he now plans to release a ‘venomaise’, mixing the sauce with mayonnaise. If you fancy trying out the sauce, you can buy bottles of it online now, costing £6.50 each.